Since summer is practically here and it’s hot both indoors and outdoors, few people feel like cooking hot food, or spending hours in a super warm kitchen. Rather leave the heavy duty cooking for a cool day and whip up something light, quick and tasty instead. If you’re having a lunch date with your friends at your home, or planning an evening party, these snacks will prove to be especially popular. You’re bound to find your guests lingering around the table for longer than necessary in anticipation of the next round of these delicious spaghetti and meatball appetisers. Combine the cooked spaghetti with the beaten egg and parmesan cheese. Carefully wrap the spaghetti mixture around each meatball. Fry in some vegetable oil over a medium heat until golden brown. This usually takes about five minutes. 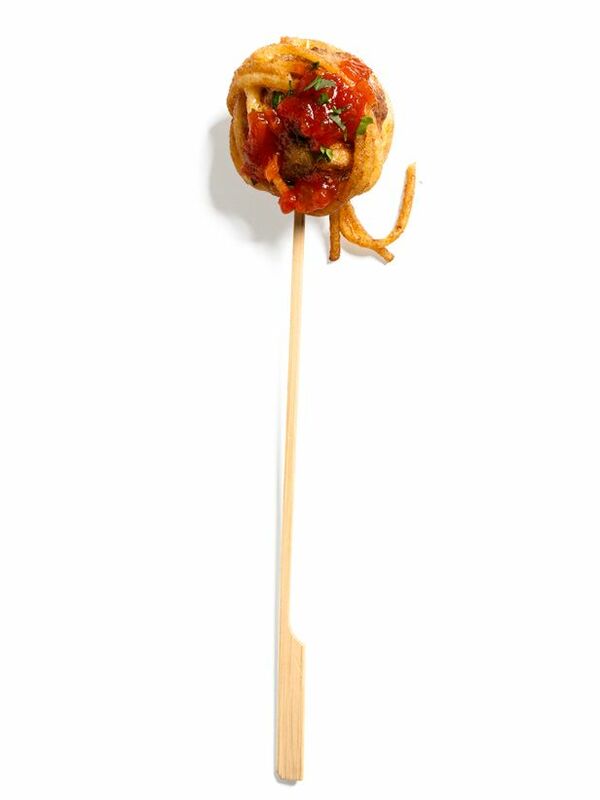 Skewer each meatball onto a stick and sprinkle with parsley. Serve alongside some marinara sauce in a separate bowl for dipping. Cabernet Sauvignon Merlot, a soft and easy-drinking ruby red wine to complement the spaghetti and meatballs perfectly. These delicious morsels will have guests coming back again and again. Neatly arrange the halved baby tomatoes on a greased baking tray, drizzle with oil and season with salt and pepper. Grill in the oven for 10 minutes or until the tomatoes start blistering. Roll out the puff pastry to the thickness of a R2 coin on a flour-dusted surface. Using a circular cookie cutter, cut out 12 discs. Keep the remaining pastry. Place the discs in a muffin pan, and prick holes into the pastry with a fork to allow the air to escape. Brush each pastry disc with the beaten egg. Rinse basil leaves and dry thoroughly afterwards. Fry the basil leaves in a little vegetable oil over a medium heat, until the leaves become transparent. In a medium-sized mixing bowl, add the cream cheese and basil pesto. Mix well. Scoop a spoonful of the cheese and basil pesto mixture into each pastry cup. Arrange a few roasted tomatoes on top of the basil cheese mixture. Garnish with a few fried basil leaves. A crisp and refreshing Sauvignon Blanc. The hint of tropical fruit, green fig and freshly cut-grass will perfectly set off the roast tomato and basil pesto topping. There’s absolutely no effort required here other than buying the ingredients and enjoying the great taste of these treats. 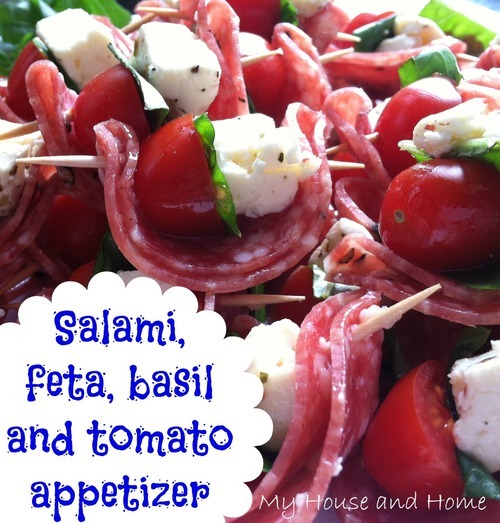 Thread one slice of salami, one baby tomato, one basil leave and a block of feta cheese onto a toothpick. Repeat step one until you have your desired amount of appetisers. A zesty and easy-drinking wine is a good choice. Consider a Pinot Grigio for its subtly perfumed floral notes and fragrances of dried apricot and peach, with an undertone of litchi to round off the flavour. 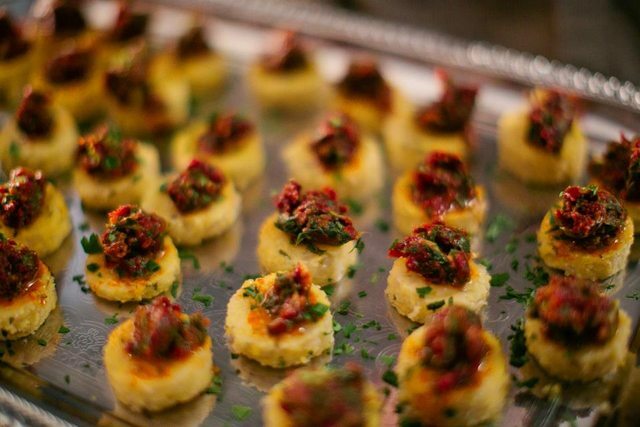 You’ll be eating more than two of these yummy polenta bites, that’s for sure. Simmer the milk, rosemary, thyme and garlic together in a large saucepan over a medium heat for a few minutes. Using a slotted spoon, remove the herbs and garlic. Slowly and steadily, stir the polenta into the flavoured milk and bring to the boil. Reduce the heat and allow the polenta to simmer until its thick, stirring every now and then, for about 10 minutes. Turn the polenta out into the greased pan and spread to create an even, thick layer. Either use a cookie cutter to cut circles out the polenta, or simply slice into bite-sized squares. Add a glug of olive oil to a large skillet and sauté the polenta squares (or circles) over a medium to high heat, until lightly browned. This should take approximately one minute on each side. Transfer to paper towels to drain the oil. Spoon some basil pesto and sundried tomato onto each polenta square. Top with a block of feta cheese. Sprinkle with salt. A medium-bodied white wine, such as a Chardonnay. This wine has the perfect balance between summer fruit, sweetness and acid, rounded off with well-integrated oak. Pure satisfaction from every golden bite. Place all the sponge ingredients in a mixing bowl and beat with an electric beater until smooth. Scoop some of the mixture into each of the cupcake cases. Set aside on a tray to cool. Remove the cupcake paper from each of the cakes. Cut each cake in half, horizontally. Fill each one half of the cake with jam and whipped cream. Dust with icing sugar and then place the two halves back together. 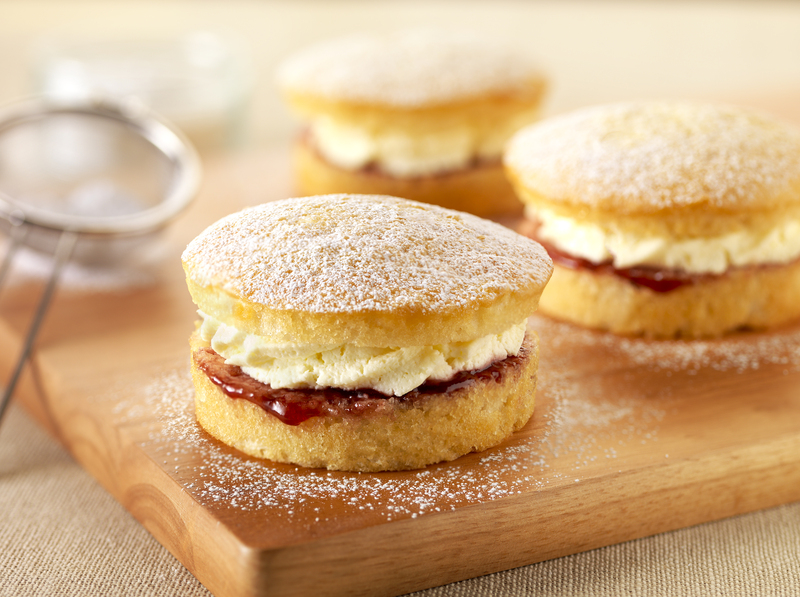 A soft and fruity wine will go wonderfully with a Victorian Sponge cake. Easy on the palate with ripe berry flavours, you’re sure to enjoy every sip alongside your dainty cake. Now all that’s left to do, is invite your friends over to enjoy some of these delicious snacks – no doubt they’re going to be really impressed by each tasty bite-sized morsel that passes their lips. If you’re looking for more wine and food pairing recipes, or recipes that use wine as an ingredient, take a look here.